Our toxics campaigner Ma Tianjie recently appeared on China's CCTV news program "China 24" to discuss the recent toxic metal contamination of water supply in Guanxi Autonomous Region. The responsible mining company, Jin Cheng Jiang Hongquan Plant allowed cadmium to enter Longjiang River, a river that leads to a critical water supply for a Chinese city of 1.5 million residents. The incident highlights the lack of transparency in China in regards to industry and their impacts on the environment. Zou Yue: We now turn to South China's Guanxi Autonomous Region where the fight to contain water contamination is just heating up. Excessive amounts of the toxic metal cadmium were detected downstream in the Longjiang River on Thursday. This comes nearly two weeks after industrial waste from a local mining company polluted a tributary upstream. And now contaminated water in the river is approaching Liuzhou, the second largest city in the autonomous region. Lv Yao has this report. Lv Yao: The city of around 1.5 million relies on the Liujiang River, downstream of the contaminated Longjiang River, municipal water supply and processing systems are on high alert. Huang Yongqiang, Vice Executive Manager of the Liuxi Municipal Water Facility: The facility has modified some processing equipment to cope with the contamination. Currently the most effective measure to reduce the level of cadmium is to add chemicals to neutralise it and turn the cadmium into sediment which can then be sifted out. Lv Yao: However, there are considerable hurdles in coping with the contaminated water especially as it is so cold and its level is low. Zhang Jinsong, Engineer, Emergency Response Team: The contamination upspring of the Liujiang River is significant and water volume over winter is kind of low. Moreover winter temperatures are low. All these factors combined add difficulties for dilution and various chemical measures. Lv Yao: Guanxi Zhuang autonomous region has initiated a second degree environmental emergency response. On January the 30th lieutenant governor of Guanxi, Lin Nianxiu arrived at Liuxi water facility to inspect the situation, showing determination to handle the issue. Lin Nianxiu, Vice Chairman of Guangxi Zhuang Autonomous Region: We'll do whatever we can to make sure the Liujiang River in and around Liuzhou city reaches safe levels and to ensure a stable water supply in Liuzhou city, including possibly tapping an underground water supply system as backup. We will make sure the tap water coming from the municipal water facility becomes safe to consume. Lv Yao: For now bottled water is going fast at local supermarkets. And Liuzhou residents are preparing for the worst. 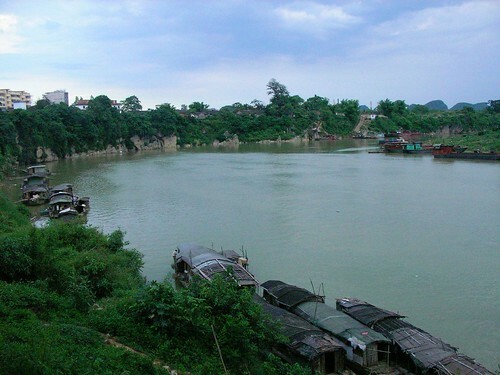 Liujiang River is the main river for all the residents of Liuzhou city. In this contamination situation maintaining safety of tap water is a critical mission and a must-win battle. Lv Yao, CCTV, Liuzhou in Guanxi Autonomous Region. Zou Yue: And now for an update on the situation in Liuzhou let's crossover to our reporter Lv Yao who is reporting over there. Good evening Lv Yao, what are the latest measures that have been taken by the local authority to ensure there is a safe supply of water? Lv Yao: Hello Zou Yue. Yes there was a news conference wrapped up about an hour ago. The latest is that the chemical measures and the dilution measures are going on from the upstream of Liujiang River, which is Longjiang River. Even in the Liuzhou city authorities state that currently the Liuzhou city is engaging a battle called 'protecting the Liujiang River' and we know that are at least 210 inspectors, 95 sets of equipment and more than 40 special task trucks are mobilized to monitor the water body situation along the Longjiang River and the Liujiang River. Along the Liujiang River there are more than 20 monitoring centers running around the clock to get the latest figures and statistics for the quality of the water. While in the city of Heche where the cadmium contamination actually happened, local authorities have been going through a very thorough scrutiny of the minerals. They want to make sure there are no new contaminated materials running into the water body. And at least at this point we know as many as seven people are being held accountable for the Longjiang River contamination incident. They are being detained by the local law enforcements and further investigations are going on. Back to you. Zou Yue: You mentioned in your story people are already storing bottled water. Are people concerned in their local area? Lv Yao: Well people are kind of concerned but as I mentioned they trust in what the government is doing now and they think the measurements should be effective. And today the Liujiang River by 8 o'clock in the morning remains normal in terms of the national standard. However, according to experts the worst case scenario probably hasn't occurred yet because in terms of the flow of water and in terms of the intensity of the contamination the biggest concern right now for the locals and the local authorities is when the peak of contamination will come and go through the Liuzhou city area. It terms of the accumulation it could arrive in five to six days from now or up to ten days, so during that time how to tackle this kind of issue and how to make sure that kind of stable supply of tap water and safe water is really challenging and a tough task. Indeed I saw some local people, like I showed in the video that they went to the supermarket to reserve some bottled water. Zou Yue: Thank you Lv Yao for your reporting from Guanxi Autonomous Region. For more on this we're now joined in the studio by Mr Ma Tianjie, an activist with Greenpeace. Well thanks for joining us Mr Ma. What does this accident say about China's environmental regulation? We have seen this before. Ma Tianjie: Yes, definitely. I think the problem lies in the day to day supervision of the polluting companies and the facilities. Even though it looks like an accident this is demonstrated by the fact that there are difficulties for the local environmental protection bureau to actually identify or confirm who is the actual source of the pollution and this shows that before this incident the monitoring and inspection is inadequate. This is not only a problem of Liuzhou or Heche, it's also happening in other parts of China. In theory there should be inventories of who is discharging what, by how much so that when you have an incident like that you will be able to trace or trackback to who is polluting. But this is not happening. Zou Yue: How much harm do you think it will inflict on the people? What kind of measures should be in place to prevent this from happening again? Ma Tianjie: I think cadmium first is a very toxic heavy metal and long term exposure can lead to things like kidney damage and other health impacts. So it's a serious problem. And I think to prevent future incidents like that transparency plays a key role in the solution because clearly environmental protection departments alone cannot face such tremendous challenges for China. You will need the public at least, or environmental NGOs to be a part of the solution. But for them to participate in the solution they will need information like where are the companies located, what are they producing, and what are they releasing to the environment so that they can keep an eye on the polluting behaviors of the factories, and even giving pressure to their buyers so that they will improve their environmental performance. We have seen in the past environmental NGOs can play a key role in monitoring and inspecting these polluting factories. Zou Yue: So better transparency and more players on board? For e-mail updates on eliminating toxics: subscribe here. Next: We rank China's supermarkets: where you.. Previous: Energy future? The answer is blowin'..
That would be a hard thing to deal with if your water was contaminated. I have a lot of reserve water in case like anything like this were to happen. I just hope that this issue is fixed soon so that the people don't suffer for that long.